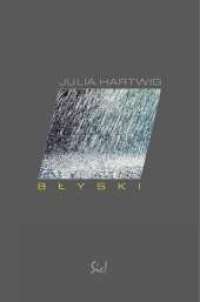 The newest volume of verse from Julia Hartwig . This time the writer offers readers not poems, but a series of original poetic miniatures she refers to as "blyski" ("flashes"): dictums and aphorisms, fragments of poetic prose, all set down in abbreviated form, various images and reflections, that are, as the poet says, "traces of the daily churnings of the mind, from which verse strives to emerge onto the passionate path of a poem or epic." Prepared on the basis of an information delivered by Wydawnictwo Sic! The book was nominated for the NIKE 2003 literary award.